I’ve been playing around with the app, Tinkerplay. I started with my MakerMonday group of students and successfully printed one to the delight of the child who made it! Then students in our FACES Special Education class designed characters during their Makerspace time. Finally, I brought in a class of 22 third graders who are reading The Indian and Cupboard. They designed action figures to place in the cupboard. From those three trials, here’s what I’ve learned. The smaller the scale, the easier it is for the action figures to break. I found 75% was perfect. Students can easily be given parameters to keep their figures from getting out of hand. In the beginning, I had one action figure with 75 pieces! I limited students on the amount of filament (grams) and the estimated print time. They had no problem with this. Saving is a bit complicated. I attached Tinkerplay to our school dropbox account and saved to there. I found that it automatically named the file with a number based on the time of day it was saved. That meant, theoretically, if I didn’t clear out the folder before a group began saving the next day, things could get messy. I also found that it was important to stagger saving so that people didn’t save on top of each other. One save per minute. I showed the students how to find the file name after it had saved so they could write it down. It made it much easier to know whose was whose later. Taking a picture of the finished creation helped students put them together when printing was finished. 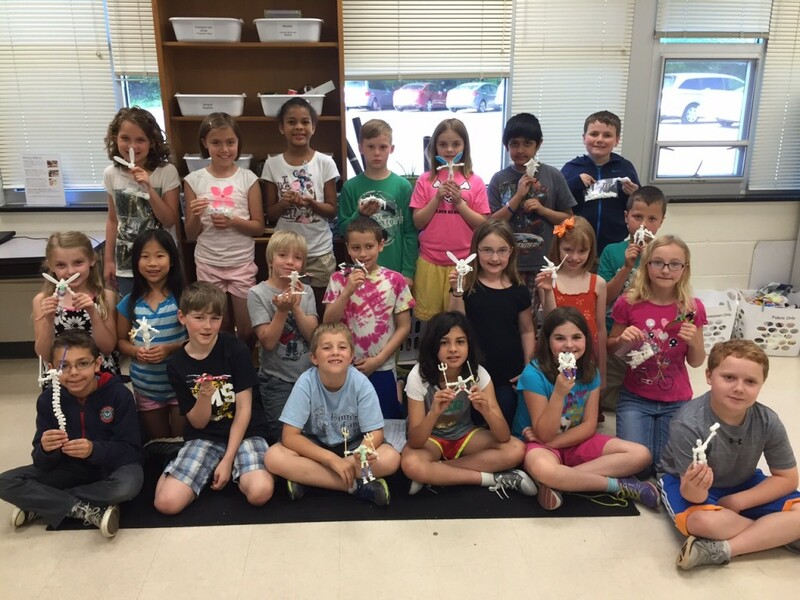 Mrs. Weikle’s class, with the help of Mr. Clark, visited the Makerspace for a STEM activity. They created Mouse Traps that contained at least one simple machine and one 3D shapes. Then they used Pic Collage to display their creations. Take look below! Take a look at a few of their traps in action! Cross posted at Oak Grove Digital Archive. Third Graders used a green screen to record part of their performance for PTA. Students acted, filmed, and edited their own explorer videos (using the app Green Screen by Doink) in the Makerspace for this project. If you missed the performance, you can check them out below! Third Graders at Glenvar are Happy! Mrs. Bralley’s Third Grade Reading Classes have been learning about Famous People. They’ve read stories, explored interactive iPad apps, researched, made story cubes, and even created their own Glogs on Glogster EDU. They are very proud of their work. Check out a few of Glogster posters below or check them all out in the class Glog Book. Students in Mrs. Bier’s writing class researched and wrote interactive Science books on various topics like electricity, rocks and minerals, and magnets! Along the way, the took videos and pictures and even completed science experiments. There are two versions of each book: epub and pdf. The epub contains videos and audio and can be downloaded in iBooks (on an iPad or iPhone/iPod Touch) or any other ebook reader. The pdf can be downloaded on a computer and printed but does not have interactive features. Check them two examples below.